Our comfortable bedrooms are fitted with TV, Phone, bathroom with WC, bath or shower. 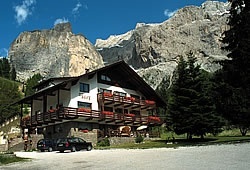 with a beautiful view on the Gruppo Sella and the Sassolungo. We are confident that you will find the service and the attention in our Garni to your liking. Free events and activities for our guests!!!!! 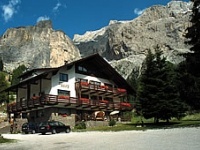 The Garni Wolf is situated between the Gruppo Sella and the Sassolungo mountains.From here it is possible to ski directly to the splendid slopes of Carosello Sellaronda Superski. Gratis parking in front of our house.